Signed lower right and titled en verso. William J. Kaula (American, 1871-1953). William Kaula is one of the finest impressionist landscape painters from the Boston school. He was born in Boston in 1871 and lived most of his professional life in Boston and in New Ipswich, New Hampshire. He studied at the Mass Normal Art School, the Cowles Art School, the Academie Julian in Paris with Collin, and with Edmund C. Tarbell at the Museum School (Boston). Tarbell became his most admired mentor and oftentimes the two painted side by side in New Hampshire. 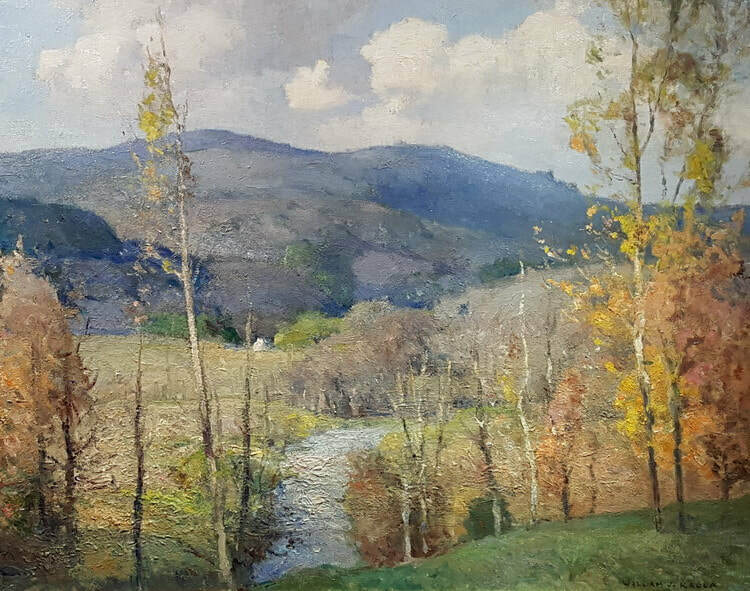 During the 1930s, the artist developed a style that was expressionistic, using less brushstrokes and painting compositions that depicted large expansive skies rolling over New Hampshire hillsides. Kaula is considered one of the best landscape painters who trained under Tarbell and was known as a "Tarbellite". Kaula exhibited extensively throughout his career, winning a medal at the Pan-Pacific Exposition of 1915. He met his wife/artist Lee Lufkin Kaula (known for her portraits and genres of children) in France, in 1894 and they married in 1902. The couple maintained a studio-home in the Fenway Studios on Ipswich Street, Boston, from 1905-1953. Throughout his career, Kaula maintained a position of esteem in the Boston art circles. Before he died, the Copley Society gave Kaula a one-man show. Kaula was a member of the Boston Art Club; New York Water Color Club; Paris Art Association; Boston Water Color Club; Boston Guild of Artists; President, Boston SWCP and the American Water Color Society. His work is represented in the permanent collection of the Museum of Fine Arts, Boston.